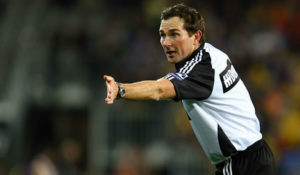 Home Big Opinions The Assistant Referee Syndrome! This ARS is a disease that infects many players, although scrumhalves and hookers appear to be the most susceptible to the infection. Some of those that contract the disease are cured, yet others are simply incurable. Sometimes it is so bad that it seems that a referee has 30 Advisory Officials on the field with him during a game. Who can blame a referee that reacts to the constant provocation? A couple of weeks ago we saw Wayne Barnes firmly put Ma’a Nonu in his place when he suggested a yellow card was appropriate for a tackle against a team mate. Last Saturday, we watched Glen Jackson stop the game and approach the Lions Team Doctor, who was somehow allowed to patrol the touchline of a Super Rugby game alongside the officially sanctioned Assistant Referee, and tell the medic that he was not the referee, and that he should keep quiet. This ARS infection has been around for a while, but seems to be getting worse week by week. We have watched Australian captains slow the game down (deliberately?) to question every single decision made by a referee. Stephen Moore was particularly badly infected by the Syndrome, and seem to have passed it on to Michael Hooper. Of course, they are encouraged by their national coach, Michael Cheika, to question referee decisions as often as possible. And the rest of the Wallaby team frequently follows the captain’s example and questions everything the referee says or does. Scrumhalf Nic White was a particularly aggressive ARS infected individual. Scrumhalves are particularly badly infected with the ARS disease. They seem to think they are some kind of manic traffic cop, all arms waving and furious faces. We have seen Craig Joubert stop a game and then call Sharks scrumhalf Charl McLeod over to tell him that he had had enough of McLeod’s hectoring, anymore and he was off. Nigel Owens (bless him for his sense of humour) stopped a game to tell scrumhalf Tobias Botha to cease and desist. Nick Phipps was lectured by Wayne Barnes about lying….. The constant chatter, chirping, and advice from players aimed at the referees is a blight on our game! More recently we have seen the “cluster attack” approach so beloved of the scum that play the round-ball game. They furiously cluster around a referee and aggressively yell their advice and disenchantment straight into his face. This has started creeping into rugby, and is simply unacceptable. Refereeing remains one of the toughest roles in all of rugby, perhaps the toughest. The constant confusion around the laws, the increasing use of replay technology, ever-changing rules and law trial experiments, and the increasing trend of questioning and criticising refereeing decisions by coaches’ and team officials simply heaps more and more pressure on the referees. Refereeing is also something of a thankless task. Match reviews do not comment on the referee’s performance, unless he has made a mistake. Referees are not congratulated when they handle a game well. The media heaps opprobrium on any referee who might do something they do not like. Consider that the referee is sent onto the field to handle a game where 30 grown men collectively make something around 125 mistakes in every game, while trying to thump the living daylights out of each other. That is approximately one mistake in every 38 seconds of the match. Factor in the time spent setting scrums and lineouts, and the indiscretions happen far more frequently. The referee has to decide which of those mistakes requires him to blow the whistle immediately, and restart the game, and which he can let go and apply some level of advantage play to the other team. He has to watch for a multitude of possible mistakes, infringements, technical errors, and control the run of play too. And he is not allowed to make a single mistake?? Have you read the Law Book? Have you tried to understand every item in it? Have you ever refereed a game? The constant bickering, arm waving, gurning and face grabbing disbelief, and chirping by players simply adds to the confusion, and I am of the opinion that the men in the middle are not offered the protection and help they should be getting. Officialdom needs to crack down, hard, on players who put verbal pressure on a referee during a game. Many referees already use their common sense, or a touch of humour, to control players, defuse situations and calm things down. Nigel Owens has been at the forefront of that style of refereeing. Others are following his example. But a refereeing sense of humour and superior negotiation skills are not enough. I believe the time has come for a far more authoritarian approach. Send the chirper to the bin. Period. If the whole team is chirping, send the captain for a rest. He will put a stop to it soon enough. Do it once or twice, and the whole issue will go away. Once teams and players are aware of the possibility of sanction if they have a go at refereeing the game, they will cease and desist forthwith. Except, perhaps, some scrumhalves. Their ARS is incurable. I do believe that our great game is administered by people who really do listen and act. I see some of the silly infractions such as the invasion of space at the lineout and being ahead of the ball at restarts, is being policed. SH is a bit behind the North as they have taken the lead in clamping down on those who test the patience of the game onfield management. Long may the ref be referred to as SIR and that is not CUR Youngs, Care, Phipps and Duvenage.